Over 3,200 Pages! 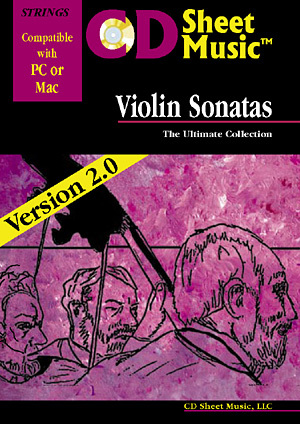 The world's largest collection of violin sonatas from beginner to virtuoso (solo parts and piano accompaniments). Composers include: Bach, Beethoven, Brahms, Busoni, Corelli, Debussy, Delius, Dvorák, Elgar, Enesco, Fauré, Franck, Grieg, Handel, Haydn, Mendelssohn, Mozart, Nardini, Nielsen, Saint-Saëns, Schubert, Schumann, Sibelius, R. Strauss, Tartini, Telemann, Vivaldi and more. Version 2.0 adds composer biographies, Violin, Sonata and related articles from the 1911 edition of Grove's Dictionary of Music and Musicians.